juanbook: MotoGP: My Thoughts on Repsol's Press Release "Without sporting values it makes no sense to be a sponsor"
MotoGP: My Thoughts on Repsol's Press Release "Without sporting values it makes no sense to be a sponsor"
"Dani Pedrosa achieved a great victory today in the Malaysian Grand Prix -a win that was unfortunately overshadowed by the unacceptable and unsportsmanlike conduct of Valentino Rossi against Repsol Honda Team rider, Marc Marquez. On the seventh lap of the race, with Marquez and Rossi immersed in a battle for third place that involved several overtaking moves between the two, the Italian -in an absolutely intentional action- dealt an unsportsmanlike kick to the Repsol Honda rider that knocked him to the ground. Although Marquez was fortunately able to escape unharmed from the attack, for Repsol the conduct of Rossi is absolutely unacceptable because it endangered -in a premeditated and unsportsmanlike manner- the safety of the Repsol Honda team rider. 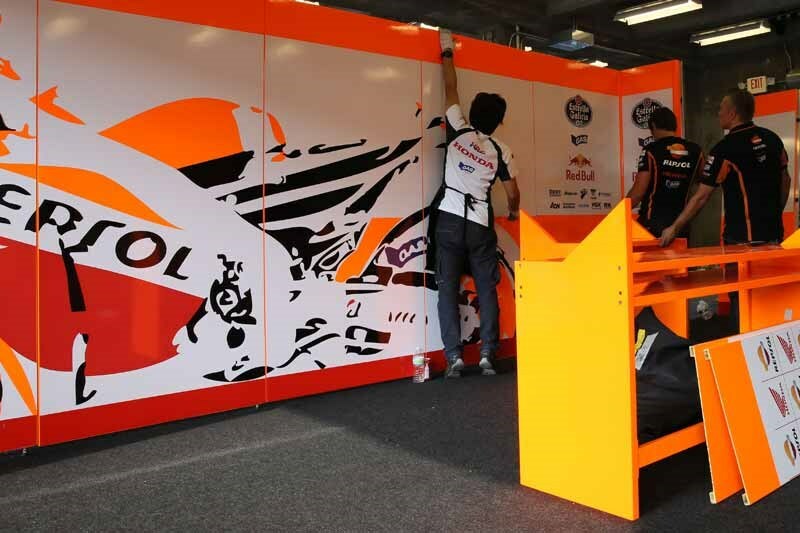 Repsol consider this an unsportsmanlike act incompatible with the values of sport and competition. Repsol are deeply saddened that situations like that which occurred today in Sepang exist, especially as the company feel proud of sporting values: Companionship, competitive spirit and commitment from riders. Without these values, it would not make sense for Repsol to participate in the sport as a sponsor. Repsol also call for a clear and strong regulation in the interest of the safety and physical integrity of the riders, which punishes behaviour like that seen today clearly and decisively. The positive thing about this race was the great performance of Dani Pedrosa, who gradually pulled away from his rivals to score his second win of the season -following that achieved in Japan two weeks ago." As far as the result of the incident at Sepang, I think that the outcome while unfortunate for Rossi and for me as someone who wants to see him win a 10th World Championship. I think that there are three ways you can see the last two races; Through Rossi-colored glasses, Marquez-colored glasses, or through impartial glasses. I have Rossi-colored glasses on. The impartial glasses of race direction at Sepang penalized Rossi but did make a point to state that that there was evidence that Marquez was trying to hamper Rossi's race though there was no rule against such a thing as long as there was no contact which there wasn't. When I watched the Phillip Island race I all I saw was an amazing race. When Rossi came to last Thursday's press conference and laid his accusations down and then armed with time sheets he claimed proved that Marquez was trying to interrupt his race laid even more accusations to bear with the Italian press. I didn't go back and re-watch the race but in all the years I've watched Rossi in press conferences I've never seen him behave in such a way. At that point I was thinking that this was some sort of classic, brilliant Rossi mind game. -Seeing how easily Jorge got past Marquez and how hard he then fought Rossi only would have served to reinforce that belief in his mind. -Rossi wanted that 3rd, but if he believed that Marquez was actually faster than and just messing with him what would slowing down to attempt to settle for 4th do? Wouldn't Marquez just slow more and continue to fight? -If those were his beliefs I could see how he ended up slowing and trying to give Marquez a physical warning. I could see him believing that this guy will not stop hounding me and will eventually force me into an error where I end up on the ground. -I believe Rossi's story that Marquez's handlebars hit his leg and pushed his foot off the footpeg and that he did not kick at him. -I do think that Rossi made the move knowing that there would be a post race investigation but thinking that he would be able to argue his way out of a stiff penalty "because he's Rossi". I don't think he anticipated that Marquez would crash and the eventual outcome. Since I am a fan of Rossi I can excuse all of his actions by justifying them in the way I just did. Having said that I have never seen a single thing that makes me think that Marquez had anything but maybe a lingering annoyance with Rossi for some moves made this season. I would say overall that there is a 49% probablilty that Rossi was right about Marquez, and a 100% chance he picked the worst person to make an enemy of... Unnecessarily.